Brossard City Hall. Photo courtesy of Affleck de la Riva. 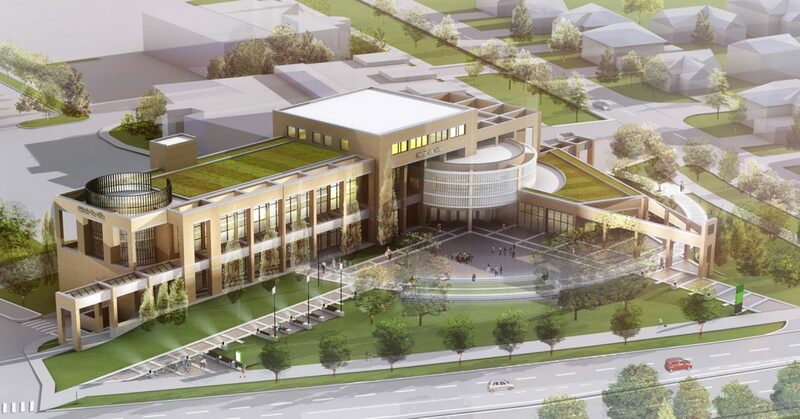 Construction is underway on a major facelift to Brossard City Hall. Located on the south shore of the Saint Lawrence River, Brossard is one of Montreal’s fastest-growing suburban communities. Designed by Affleck de la Riva Architectes, the $15-million project transforms an automobile-oriented entry drop-off into a generous civic plaza, provides state of the art administrative spaces and fully restores the building envelope. Completed in 1991, Brossard City Hall is an excellent example of the Post-Modern civic architecture of its time. Affleck de la Riva’s project respectfully restores the building’s monumental masonry elevations, conserves existing vegetation, and completes the enclosure of the city hall’s new civic plaza. A council chamber sheathed in translucent glass is placed at the focal point of the new civic plaza and typical Post-Modern elements such as a clock tower and masonry arcades have been conserved and woven into the proposal. Based in Montreal, Affleck de la Riva have been active in the design of cultural buildings and public spaces for more than twenty years. The work of the firm grows out of a belief that quality environmental design is an agent of social change and a key element in fostering citizenship, social equity, and healthy lifestyles. Brossard City Hall is one of a trio of municipal buildings recently designed by Affleck de la Riva, including a new city hall in Rigaud, Quebec and the restoration of Montreal City Hall, a national historic monument. Another recent project was the renovation of Montreal’s Cabot Square.